HAPPY BIRTHDAY TO SCARLET LEAF REVIEW AND A WARM SALUTE TO MIHAI EMINESCU! On January 15, 2016, the first issue of the Scarlet Leaf Review saw the light of the Internet. One year after, it's reached 462,478 hits and offered us the joy of reading and publishing authors of all nationalities, ages, genres and ideas. It's been an interesting year - we have grown a lot and learnt a lot. This year opened our eyes to a new world of literature. We have had the chance to publish authors for the first time but also to enjoy the writings of seasoned authors. There is more ahead of us but we are proud of what we have accomplished with the contribution of so many talented people. We are also grateful for the chance we have had - to encounter so many promising talents and to join a world of ideas and principles. We want to thank you all of you: authors and readers. You have made this year of existence exciting and memorable. The Jan 15 2017 edition will not follow the same recipe as the ones before. The structure is different. Don't worry: we aren't as nonconformist as we may seem! On Jan 16, the regular issue will be live as well and will not differ in structure as this one. Keep in mind, you can look at the categories on the right side of the page and find the name of the author you want to read. Will kneel before thy door. " And thy eyes chill my heart. " Is clinching now her soul. Swimming in the sun's flames. That but into dark peep. Thou wild look fair and proud. " When into them thine shove". -"But how wouldst thou that I come down? One of those that must die!" Be mortal as I am!" For but one kiss of thine! For thy fierce love I pine! Am tied, I shall be freed!" Went for many a day. "A flower just to pluck! Thy chance to try thy luck!" Alone and go thy way!" From thoughts that have no fun. Give me a kiss, just one!" I've kept my strong desire!" Thee all about love's balm! And listen and be calm. Enlace me with thy arm. Thou must lift on thy heels. Sweet, eager, looks for life. Kiss me too and again. " Wills not, and now she wills. My temper thou wouldst fit. To the sea lone and dun. That his hand I'd ne'er reach. My soul his cold ray bar. . .
For ever he'll rove far. Lands our own fate let's frame! Flee in less than a flash. Ocean that swimming nears. . .
To life from the dark voids. Be praised in the whole world! Thou gives life and death too. To love but for an hour! To that my former nest. . .
From rest, I crave for rest!" That have no name nor form. Men will be born again. New waves spring from behind. Death we have never known. And die to be reborn. Thou wouldst set down or flee. And settle on its height! I cannot give thee death. For whom thou wantest then to die? All o'er again he pours. Her sparkles again drone. . .
Two youths sit all alone. On my passion's dark shades. And also my last dream!" With long and golden locks. And o'er my good luck gleam!" 'Tis me or some one else? 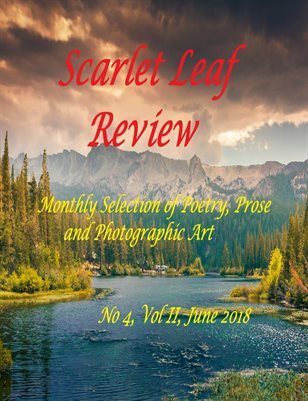 Happy Birthday to all at the Scarlet Leaf Review!!!!! Thank you! A huge thank you to all the authors that have submitted their work to us.